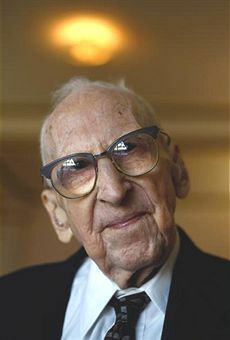 Walter Breuning (born September 21, 1896) is a Super-centenarian. At the age of 114 years, he is currently the 2nd oldest [verified] person in the world. He has been the oldest living MAN in the world since July 18 2009, and the last known man still living who was born in 1896. 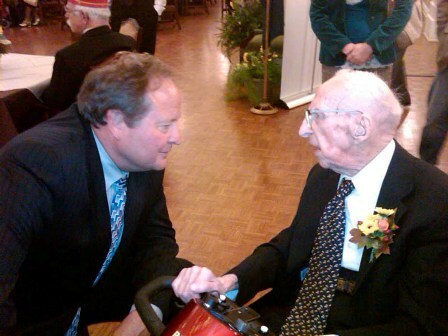 On his 110th birthday, Breuning was declared the oldest living retired railroader in the United States. The governor of Montana, Brian Schweitzer, and the city mayor attended his celebration. He is one of the last two males still alive today who were verifiably born before the year 1900. He is one of only five men in history to have undisputedly reached the age of 114. Breuning is the oldest undisputed American-born man ever, and since December 12, 2010, the fourth oldest undisputed man ever. Walter Breuning was born in Melrose, Minnesota. He is the son of John Breuning and Cora Morehouse Breuning, and had two brothers and two sisters. In 1901 when he was 5, his family moved to DeSmet, South Dakota, where he went to school for nine years until his family broke up in 1910. Breuning referred to this time as “the dark ages”, as his family lived without electricity, water, or plumbing, describing it as “carry the water in, heat it on the stove. That’s what you took your bath in. Wake up in the dark, go to bed in the dark. That’s not very pleasant”. Longevity runs in Breuning’s family. His paternal grandparents lived into their 90s, and his siblings lived to ages 78, 85, 91, and 100 although his parents had more typical life spans for their cohorts. In 1910 aged 14, Breuning dropped out of school; he began scraping bakery pans for $2.50 weekly. He joined the Great Northern Railway in 1913, working for it for over fifty years. Breuning commented that during his early years, he would have to hide from the railway owner, James J. Hill, as Hill did not want any railroad employees under the age of 18 (Breuning was first hired at age 17). Breuning worked for the Great Northern Railway until age 66, and was also a manager/secretary for the local Shriner’s club until age 99. During World War I, he signed up for military service, but was never called up. He moved to Montana in 1918, where he continued working as a clerk for the Great Northern Railway. There, he met Agnes Twokey, a telegraph operator from Butte, Montana. He was married to her from 1922 until her death in 1957. They had no children and Walter never married again stating that “Second marriages never work; even first marriages don’t work today.” When World War II broke out, he was too old to serve. 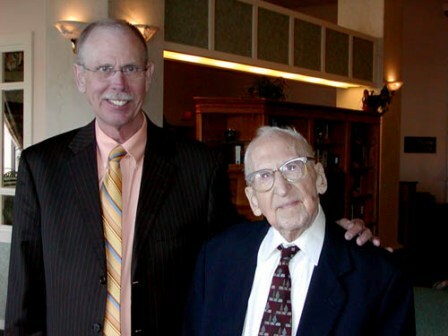 Having lived at the Rainbow Retirement and Assisted Living Center in Great Falls Montana for the last 32 years, Breuning is in excellent health, even after a lifelong habit of smoking cigars, which he quit in 1999. He is able to walk, and eats two meals a day. He still maintains a sharp mind and accurate memory. For example, he can remember his grandfather talking about his experiences in the American Civil War when he (Breuning) was three years old, and remembers the day President William McKinley was shot as the day “I got my first haircut”. He takes no prescription medications. 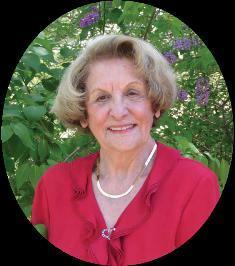 In November 2007, at the age of 111, Breuning was fitted with hearing aids. The week before his 113th birthday in September 2009, Breuning had fallen and bruised his scalp, but was otherwise unhurt. On February 16, 2009, Breuning made an appearance on the News Hour with Jim Lehrer, giving his views about the current state of the economy and the newly elected president. Breuning said that the first President he ever voted for was Woodrow Wilson, and that the most memorable news item he ever heard about in his life was the Stock Market Crash of 1929. He also described life during the Great Depression. The BNSF Railway named the west end of its new Broadview Subdivision, where it meets the ex-Great Northern Laurel Subdivision near Broadview, Montana, “Walter Junction” after Breuning. He was present at the dedication of the new line, which serves the Signal Peak Mine, on September 2, 2009. 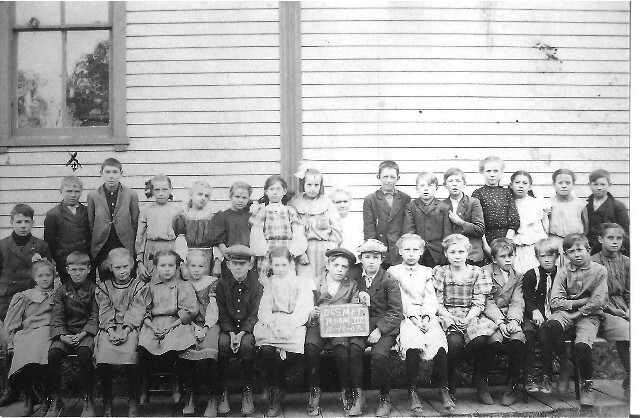 In this school photo, Walter is standing under the window, with the “X” above his head. The slate carries the date of 1907, making Walter about 9 years old. Montana Governor Brian Schweitzer chats with Walter. 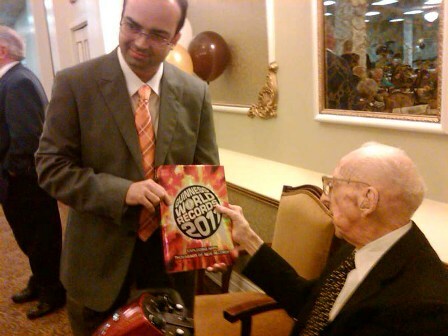 Walter receives “his copy” of the Guinness Book of World Records, listing him as the World’s Oldest Man. UPDATE 6-11 Walter passed away April 2011 at 114 years of age. The current oldest man in the world is a 114 year old man in Japan.